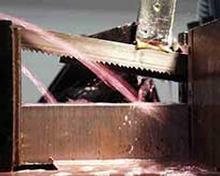 Is your band saw bouncing or jumping through the saw guides? This is a serious issue, but a tough one to understand, because there are a variety of issues associated with bouncing saw blades. To ensure your blade doesn?t take the damage bouncing can cause, it is important to be aware of what the root causes of blade bounce are, so you can fix the problem. Here are a few of the common causes you should be on the lookout for. First, it is important to check the straightness of both the blade and the weld to make sure that neither of them is interfering with the cutting operation. A lack of straightness in either the blade or weld could be causing the blade to bounce. Next, it is important to check the blade tension and make sure that it is high enough to keep blade bounce to a minimum. That way, your blade won?t take as much damage. Keeping the wheels in good condition is an important variable when it comes to avoiding blade bounce. If the wheel bearings are poor, then blade bounce is more likely to happen. Furthermore, it is key to always make sure that the blade isn?t bent and that the blade guides are both intact and functional. With patience and organization, you can ensure that your blades remain bounce-free. Often a blade will "bounce" or "jump" when passing through the saws guides. This will cause problems by overloading the blade gullet, or causing expensive damage to your head feed system. The following is a list of the most common causes for a "bouncing blade". Blade tension is set too low. Wheels are out of round. If you have any questions, contact Sawblade.com at 800-745-6920. Our experienced customer service professionals are seasoned veterans of the saw blade industry, and are ready to take your call.